I’m a member of Utata, an online arts journal that focuses on themed group projects. Each winter’s “big” project combines image and text; this year’s theme was to create a fake band: liner notes, lyrics, song titles – whatever you could come up with. I had my three all-time favorite muses be characters in this story. We laughed, we gossiped and whether they realized it or not, their patience got me through a trying week (thanks girls!). I thought this project would be cake going into it, but I learned real quick. 1. It’s really hard to come up with a clever band name. Seriously, everything’s taken. 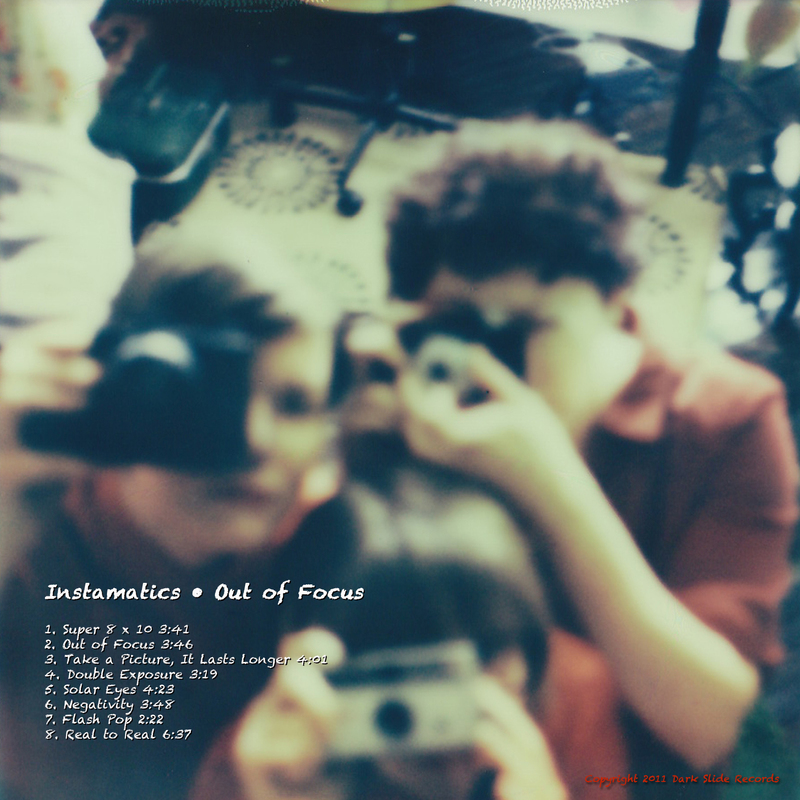 I wanted a photography album theme, so I chose the camera that Jody held in the “back cover” shot, but there is an Australian band called The Instamatics. Dropping “the” was an easy fix. 2. 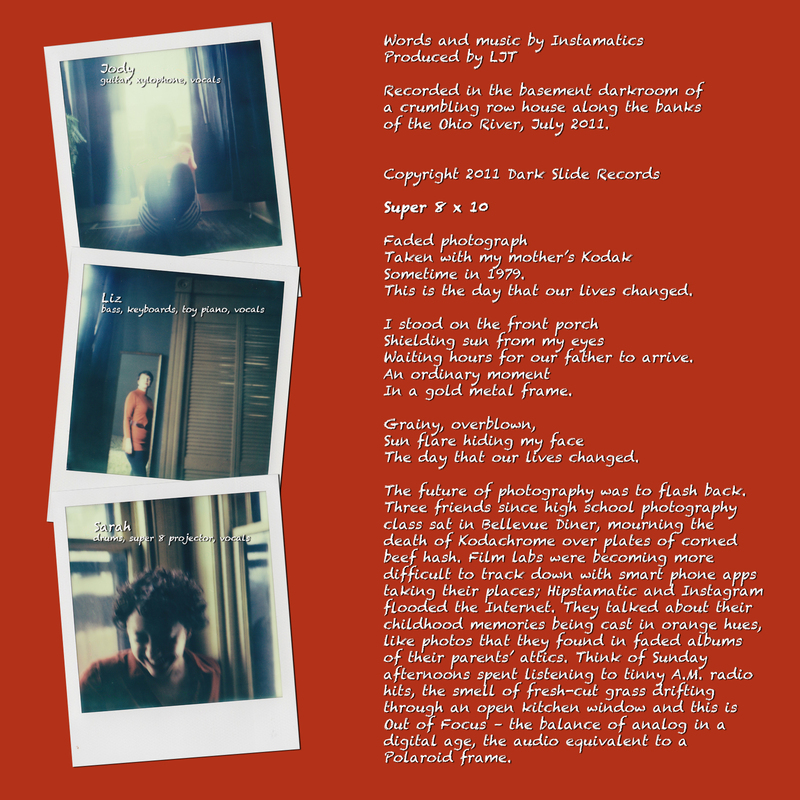 It’s really hard to write engaging liner notes. I spent a lot of time at Retro on 8th one weekend flipping through vintage records, getting lost in Kenny Rogers anecdotes, Henry Mancini bios (an Aliquippa boy, I learned from reading the insert) and Deep Purple song lists. It’s a lost art form, one that I haven’t paid much attention, admittedly, since I was a kid with headphones plugged into my mother’s stereo, following Led Zeppelin tunes to the lyrics sheets. 3. Which brings me to lyrics. They are the hardest thing of all to write, a precarious balance of poetry and music. I realized that strong, moving lyrics – no matter how awesome or cheesy – involve a lot of pouring out your heart, something I’m feeling a little protective of these days. This was a lot of fun to create, and I love seeing everyone else’s “bands,” which you can check out over here. This is friggin brilliant! And I mean, the coolest idea. Ever. You did a great job. yay, thanks! this put all those ‘what if i had a band’ talk to good use ;). Love the cover shot and the tin roof! Out of focus indeed–just great, you have me chuckling away here. Thanks. I’m glad that you like it! Isn’t that roof fantastic? It’s one of those moments where had I not been down a few stairs I never would have caught it. thanks, dude – and don’t worry. we’ll get some shots of the upholsterers soon enough (hehe). The back cover is the absolute best! thanks, lady! that shot was pretty hilarious to get: me standing on a tiny stepladder and the 3 of them trying to squeeze into a small square frame. great concept! I wonder what the artists will come up with to rival this??? thanks, beck! you mean, like a ‘battle of the bands’ (remember those at graffiti?)? the lyrics are in my head for it as i type this (hehe).